Oracle BPM Interview Questions: The below-given BPM questions are focused on the concepts used in the implementation of a business project. The topics covered in the BPM interview questions are Start Events, End Events, Intermediate Events, communication activities, Signal Events, Gateways, Subprocess, Event Subprocess, and Exception handling. Let's have a look into the below provided Oracle BPM Interview Questions. 1. What are the Start Events in Oracle BPM? These Events comes into the picture at the start of a process. These events are consumed by a process. So they are also called catch type events. None Start Event: A None Start Event must be followed by an initiator task human activity. A subprocess must contain none start event at the starting. 2. What are the End Events in Oracle BPM? At the end of every process, End Events come into the picture. Below is the list of End Events. 3. What is an Error Catch Event? 4. What are the Intermediate Events in Oracle Business Process Management? There are some events which occur in the middle of a process. 5. What are Timer Catch Events in Oracle BPM? Creating a delay before running an activity. Configuring a deadline for an activity. Configuring a deadline for a process. Triggering additional activities after an elapsed time. 6. How to implement communication with other BPMN Processes and services within the project? Service Task: Using Service Task we can invoke a process or service. It can only invoke the synchronous process from another synchronous or asynchronous. Call Activity: Call Activity is used to invoke a reusable process only. Send and Receive Activity: By using Send and Receive Activity we can invoke another process as well. These are similar to Catch message and Throw message. Note: The only difference between message events (Catch Message and Throw Message) and send and receive tasks is, you can add boundary events to the latter. If you are invoking an asynchronous service and you want to add a deadline using a timer event which configured as the boundary, then you must use a send and a receive task instead of using message events. 7. What is Event Sub Process? 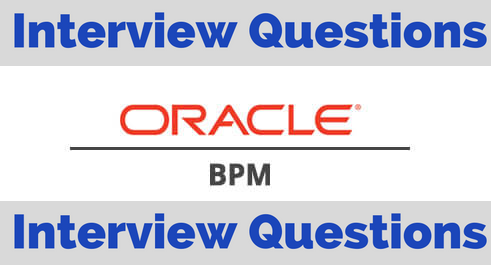 Check the answers for the below Oracle BPM interview questions in the next post. 9. What is Event Sub Process? 10. Explain Correlation in Oracle BPMN? 11. What are the different types of gateways in BPM? 12. How to use Oracle BPM Multi-Instance subprocess?